I hit the garage sales today. I didn't think there would be too many, but I managed to spend fiddy dollars. It seems a bit much, but that did include a nice donation at a garage sale for a family that is raising money to adopt a boy from the Philippines. I love the chair and can't wait to paint it and recover it. I'm keeping it! Aren't those little boots the sweetest thing? 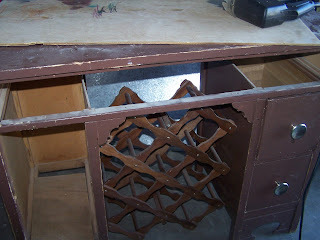 And what about the cool sewing cabinet? 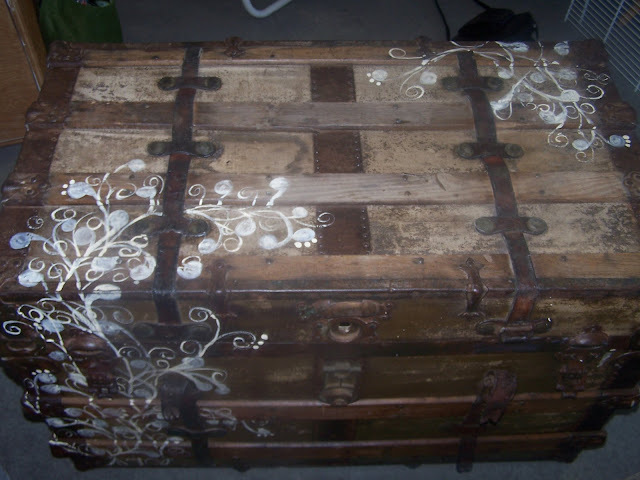 The lady wanted $25 for the old trunk--her hubby took $5 for it. Those are old wooden levels sitting on the trunk. And the cabinet or TV stand is solid wood. The candle thingy--well not sure what I will be doing with that, but something with spray paint (Joy may have passed her addiction on to me!). The headboards will become a bench. Well, I got a lot of work to do now with all of these new things. So I am off to labor over this Labor Day weekend! Got home Sunday to find my computer had crashed. Teenage son says he has nothing to do with it, but I am still not sure. Anyway, hubby got 'er back up and running last night (thank goodness!). I was a bit freaked out because I didn't have things backed up at all. The first thing I did when the computer turned on last night was back up my word documents (which is my preschool brain) and all of my picture files. Now you would think I would have had four days to make stuff to show you all, but I did not :(. I have been very busy preparing for preschool. We don't officially start until next week, but we had a playdate in the park today, complete with crafts and games and story. So it may be a few more days until I get to the garage. I did have a little fun with spray paint. 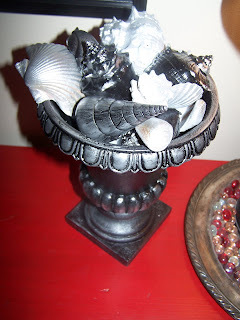 I spray painted this brown urn black, along with some shells. I then used silver rub on them, which is way fun and addicting. Be careful though it can be messy too. I also spray painted some of the shells silver. Joy at Joys of Home http://joysofhome.blogspot.com/ hosted a spray paint party. Now she was trying to think out of the black box, because she has admitted an addiction to black spray paint. but I am just new to it. Have a great labor day weekend. I should be posting once or twice through the weekend so check back! I played hooky today from the Farmer's Market. Yesterday was so busy and I didn't have packing up the truck after spirit night in me. Plus it was really cold this morning. I always feel guilty when I don't show up (I did call and let them know). Not sure why the guilt--it's a woman thing. I did have one customer call my home and ask if I was going to be there. When I told her no, she said she wasn't going. I thought that was funny. I did get some garage sales in and bought some cool smaller things. I got a lot of vintage/old prints that where already framed. I took them straight out to my antique spot, so I didn't get pictures for you. One of these days I will remember to bring a camera with me out there to show pictures of my booth. I decided to step out of my normal style and paint this medical cart a little funky. I can picture it in a teen's room. Actually, when my 15 year old saw it, he thought he might need it for his room, but then changed his mind. The knobs could not be taken off or replaced, which I didn't want to anyway. They were my inspiration. 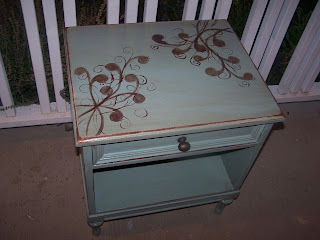 I painted the formica top and sides with silver craft paint. I used the rubber stopper from my mudroom sink to make the circles. One more question to answer: What types of things sell the best? 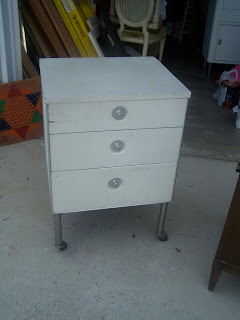 I find end tables and nightstands, especially with drawers probably sell the fastest. 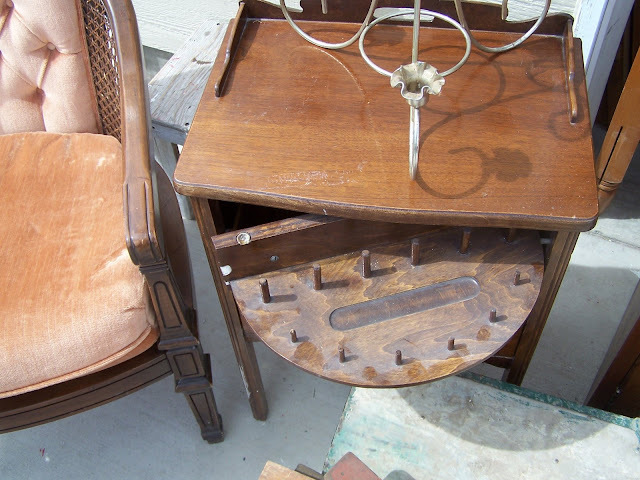 I tell friends that garage sale that I will buy any entable that they find for me that is $7 or less. 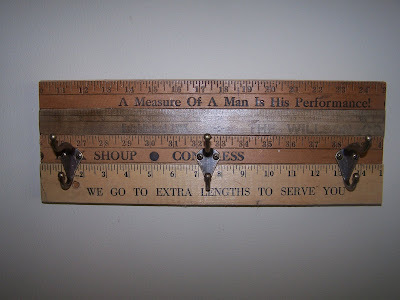 Anything to help people get organized also does well--message centers, coat hooks, etc. Children's items also sell well--little rockers and tables and chairs, but it is hard to find these in decent condition used. I used to buy some at Michaels with my coupon to paint up, but they are so poorly made, and still too expensive. Have a blessed Sunday--savor the last days of summer! Happy Friday! It is a busy day for me, but I wanted to take a few minutes to show a couple of little things and answer a few questions. We have spirit night tonight at the high school and I am taking a friend to lunch today whose daughter left yesterday for her first year of college. They are very close and my friend is sad. It is hard to imagine that chapter for me, but it is only a few years away! And, of course I need to get some painting/work done. I've had a few questions about what I do so I thought I'd answer them here for anyone who might be interested. If not, move on to the pictures Ü. I do not make a full-time income selling my junk, but hope to some day. My dream is to own my own shop, but the timing isn't right yet, although getting closer (youngest will be in school full-time this year! ), plus the economy isn't great for starting a new business. In the summers I do make enough money to qualify as a full-time job, but that is from Farmer's Market. I only attend about 8 of those. I haven't found another venue that I can sell my things as well as I do at Farmer's Market. Any suggestions, let me know! 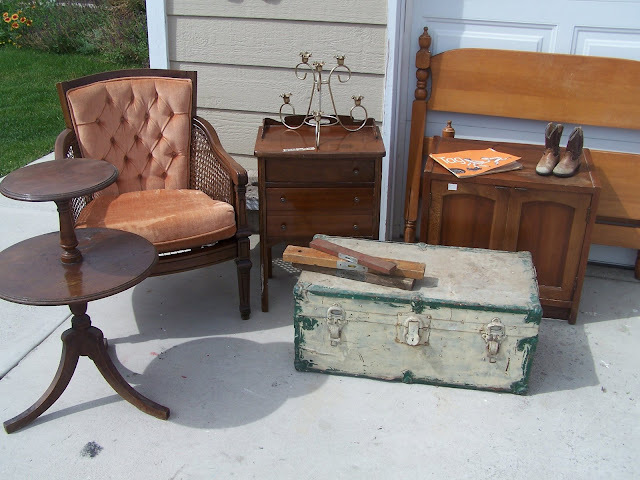 I do have a booth at an antique place and I do fairly well there--not as well as I would like. I haven't been there a full year yet, so it is still growing. I have been asked by another antique place to go in there as well, so I am considering this option. I have been able to send a lot of my Farmer's Market customers to my antique booth because I always get asked if I have a store somewhere. Hopefully they will continue to frequent it during the year. As an aside, I have also had quite a few designers buy pieces from me this year and take my card for future work so that is another way to build my business. Time--I don't keep great track of my time. I only hunt for things usually once a week, maybe three hours. 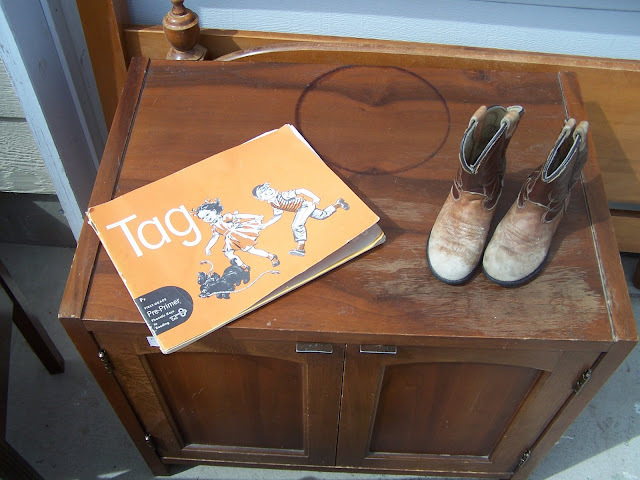 I go to garage sales early in the season, before Farmer's starts and sometimes on Saturday mornings. 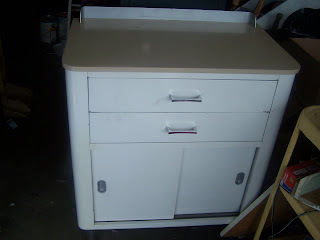 Garage sales are definitely your best deal, well beside free, roadside junk! This year I really am trying to use up more of what I have. 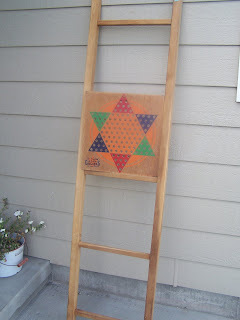 The first two years I did this, I bought anything that was wood that I could paint on, and some things were dumb purchases. I need to get rid of some of it! Also, once people know what you are doing, they give you all kinds of stuff. Time spent working on things is varied. I put in some long days if I have been busy and haven't been able to work consistently. I try to work 3-4 hours a day, 5 days a week. This includes several interruptions to make food for children (in the summer), change laundry, etc. I really do try to keep track of how long a piece takes me and charge at least $20/hour for my time. 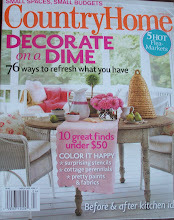 I am a magazine-a-holic and I watch color trends, plus look at what is out at Target, etc. Living in Montana, we seem to be a bit behind the color/trend curve. Black always seems to sell and red is still very popular too. The blus and browns are just catching on here. Some colors I refuse to do (unless it is a special order) because I just don't want to encourage people to decorate with hunter green and maroon anymore. 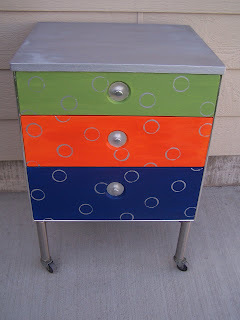 I free hand paint everything and am inspired by many things--movies (great colors in Mama Mia! 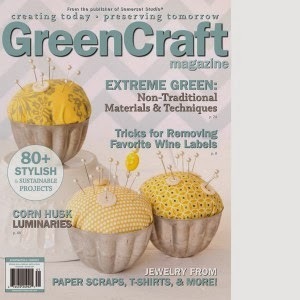 ), fabric, clothing, scrapbooking supplies, nature, etc. While I am not by any means a great talent, I do believe I have anatural eye for balance and design elements such as placement and color. Hope this answers a few questions, let me know if you have more. Now on to a few non-earth shattering projects. I made this bench for a someone who needed a little bench for her entry. 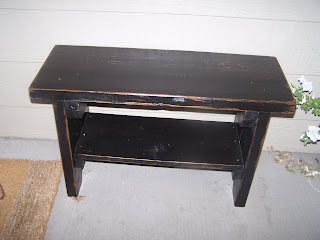 Nothing new, but it does show off well the black paint, sanded down, and stained over the top. I use either walnut or early American stain. 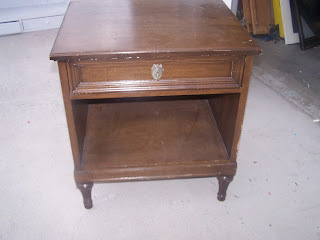 Here is the nightstand I showed earlier. It is the same design as the black tables, only in the blue and brown. I love this particular blue and I mixed it using several different paints. It has stain over the top, which makes the blue a little more greenish in tint. This was the last of what I mixed, but I saved the container I mixed it in to try and match it at Lowe's. Hope you have a great day, filled with family, fun, and maybe a little junk! This fun medical cart was only $2. I have already started working on it so tune in tomorrow or the next day to see its transformation. I got this nightstand for $3. It is made by the Henderon Furniture Co. I found a matching pair on ebay for $285. Iy does have a scratched top so it is getting painted. 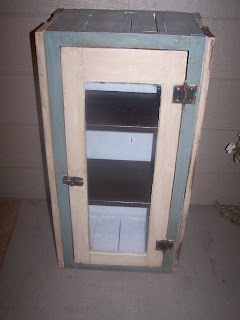 I also got a little cabinet and three shutters from the thrift shop and spent a total of $12. 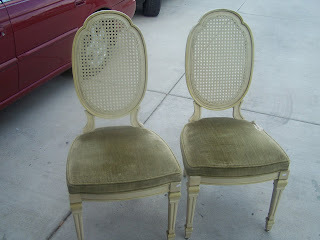 Here are some chairs that I can't wait to transform for myself. I got them at a different thrift store for $15 a piece. It was a little more than i wanted to spend and I actually left them there, but went back an hour later to get them. The caning is in perfect condition, the seat not so much, but I plan to recover them anyway. 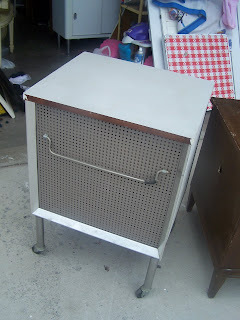 Here is another metal medical ( I think) cabinet that I got free from a friend. I am going to clean it up and take it to the antique barn as is, I think. It may just become a work surface for me too! I just can't tell you how happy I am when I find great things! I know most of you understand though. Off to paint a bit more! Good Morning! For those of you who read HGTV's message boards you know who Sharon is. If you don't, you can read about her here http://gardenjunk.blogspot.com/. I have learned a lot from her incredible creations. 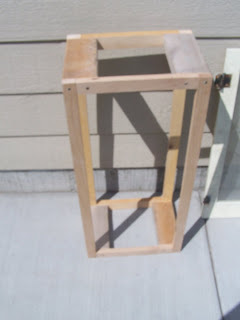 One of the main things I have learned from her is how many things can be built from a basic box structure like this one (sorry, blurry picture). 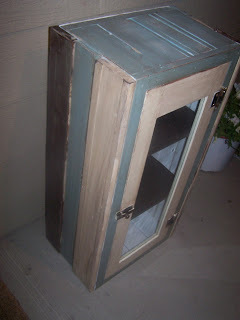 My inspiration came from some great old glass fronted cupboard doors that I picked up at the thrift store. They needed a cabinet to go with them so this is what I built entirely out of scrap wood. That is the original hardware on the door. The whole project cost me about $3 and it was the second thing that sold Saturday morning at the Farmer's Market (the yardstick coat hanger was the first). Off to the garage to work before it gets too hot--it is supposed to be 97 today 71 on Friday. Have a junky day (which is a great day in my book Ü)! For those of you who were children in the 70's you recognize my title as a play on the old saying "Keep on truckin'"--I think I had a t-shirt with that on it. 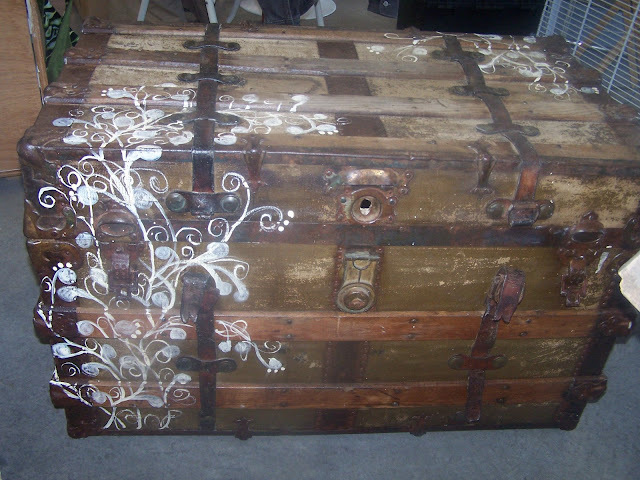 I thought it was appropriate for this old trunk--it just keeps on going. I would love to know how many "lives" it has had and who originally owned it. 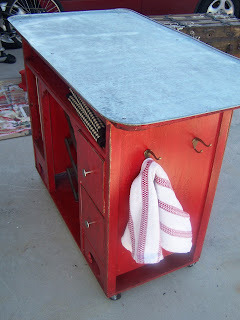 When I got it--a week or so ago--from a thrift store for $2, it was in need of some TLC. It had been used to store elk antlers--stinky!! There was some great newspaper in it from December 29th, 1949 from Omaha. I looked at it carefully, but had to toss it because it smelled so bad. The first thing this trunk got was good scrubbing with some bleach water (there were several spider egg sacks in the inside as well). 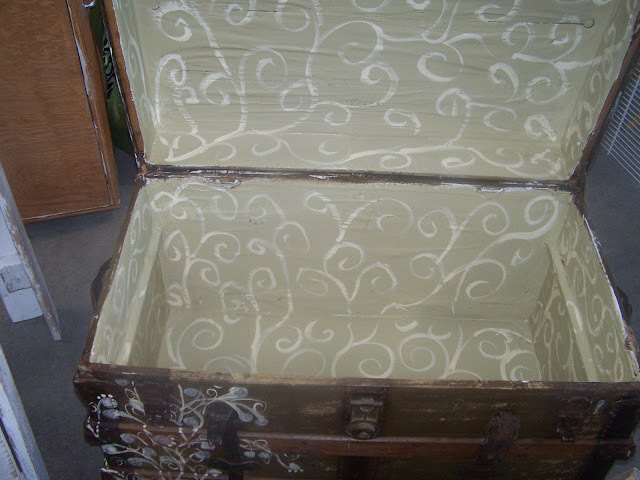 I then primed the inside and painted it, which took care of the nasty smell. I scrubbed up the outside, put a coat of poly on it before painting it to "glue" down the tears in the fabric covering. I did the decorative painting and put more poly on it. I'd like to say it is as good as new, but it won't ever be. The leather on it is fragile (BTW--there are flowers stamped on several places on the leather straps--I love details like that!). 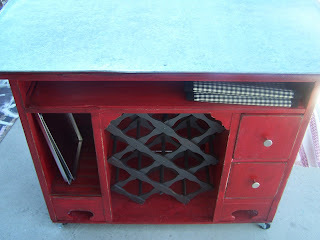 But, for now it has a new life as a fun coffee table for someone! Gotta go watch Michael Phelps swim, night night! I wish I was somewhere tropical, but alas, I am not. But I did finish up the island I had started a while back. And even though these pictures are taken in my driveway right before I loaded it up, I did stage it for you Ü. I am sure my neighbors think I am crazy! The island is made from an old desk that I got curbside. The drawers on the left were broken, so I removed them and added the board for cookie sheets. The top drawer was not sliding well, so I took it out, removed on end of it and turned it around and put it back in the space for a shelf. 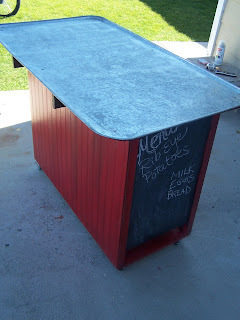 I used a tin drip pan for the top--I cut a board to go under it for added stability and positioned it to hang over the back edge for a little sitting space (I may make stools to match if it doesn't sell right away). 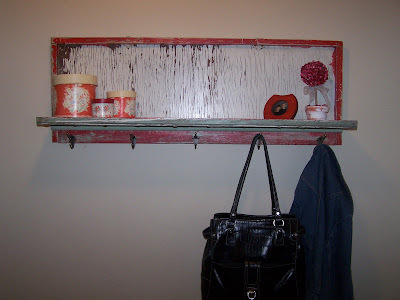 I put hooks on one side for towels or potholders and painted up the other side with chalkboard paint. I also put a board across the bottom, bead board on the back and locking casters. (not sure if you need a play by play, but you get one). I am happy with the end product and it looked good sitting at my antique booth. Hopefully it won't sit there long! I am a scatter brain when it comes to junking. I just can't focus sometimes. 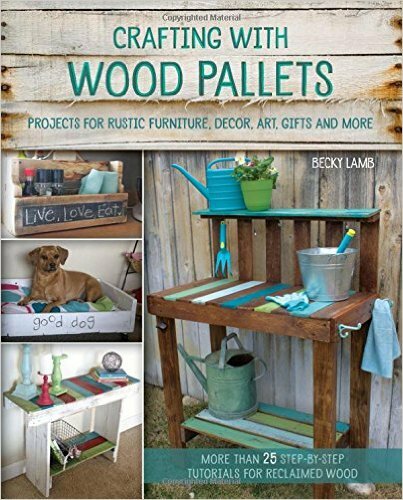 I get in my garage and I start thinking, "I can make a shelf out of this window, but wait, I want to make a table out of this door, and I was working on a kitchen island, and I have these boards here to make a coat hook, and...) I have to tell myself, "Stop! Focus! Pick a project and go with it!" I also try to work somewhat assembly line--sanding a bunch of things at once, priming them all, polying them all. But sometimes I want to feel like I have actually completed something that day, so I finish the entire poject at once. The sense of completion is good for my mental state. And a shelf/coathook made from an old primitive cupboard door. I cut a piece off of the board to use as the shelf. I added the red board that the hooks are attached to as the main door part was thin. I also added the green painted quarter round under the shelf for added stability. The shelf paint and the red trim is original. I polyed it well so that the paint wouldn't flake anymore. 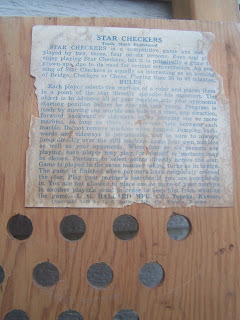 This is staged in my entry, but i will be selling it at Farmer's Market and/or my antique spot. Oh my goodness, I can't believe it is Wednesday already! Where has the time gone? Hmm--sports physicals, haircuts, birthday parties, school shopping, company, etc. I was at a family reunion this past weekend. It was fun and great to see all of my cousins and their families on my mom's side. Everyone was there and the last reunion was 5 years ago so we had a lot of catching up to do. There was unfortunately some wild weather-a lightening storm like I have never seen before and lots of rain. It lasted for three hours and was constant. You didn't need a flashlight at all- the sky was constantly lit. The people in the town where we had it (Ennis) said that it was epic. We did go into Yellowstone on Saturday--about an hour away. It was beautiful there. 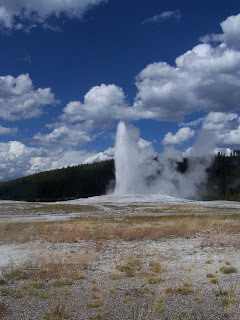 I thought I'd share a picture of Old Faithful for anyone who hasn't seen it before. I probably have a hundred similar pictures from over the years and they all pretty much look the same. I also finished the special order I had been working on--a set of bunkbeds and a dresser. 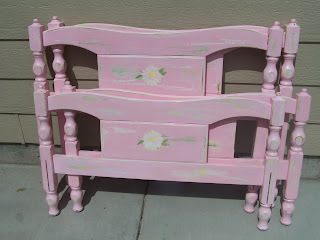 I had done a nightstand similar to this last year that they had bought foe their little girl's room. They decided they wanted the other furniture to match. I used the candle wax technique on this and since I have had lots of questions I thought I'd explain it a little more thoroughly. I first paint the piece with white primer. If I want some white to show, which I did in this, when the paint is dry, I use a white old candle nd rub some of the wax on it. You want to rub it on the edges and in streaks or patches. Also, it can't be too hot or it will melt everywhere. I then slapped on some yellow paint. By slapping on, I mean I do not cover the whole piece, so some white and still shows. When the yellow was dry, I put candle wax in some of the same places I had before and over some of new spots. I then slapped green on--some of it covered the yellow and some the white, but some white still showed. When it was dry, I used the candle one more time and then painted the entire piece pink, covering all of the other colors. When it is dry I use a paint scraper or sander to sand off the paint. On light colors like this, a metal paint scraper leaves black marks that can be sanded off. I ended up using only sandpaper on this, not the scraper. It really gums up your sandpaper, but if you sand on a rough piece of wood for a minute it will usualy get the wax/paint off so that you an continue to use the same piece of paper. It can be a long process on big pieces like this, but the slapping and layering of paint is pretty quick. I also had to paint the ladders and side rails. 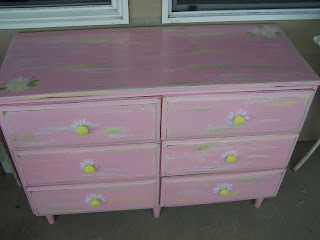 I then painted daisies on it and added silk daisies to the knobs. I am working on some smaller projects this week--most are half done. Check back in the next couple of days, and until then, enjoy the last days of summer! We went to the circus yesterday. My daughter has never been to one that she remembers. I had just bought the family movie called First of May--it is a touching story set at the circus. Tessa commented that she had never been to a circus and two days later circus tickets arrived in the mail. 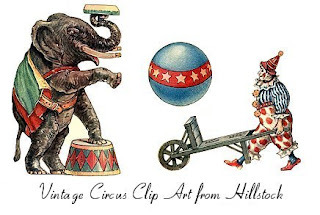 I must admit, elephants are still exciting to me and I love the trapeze act. I would love to swing on that thing! 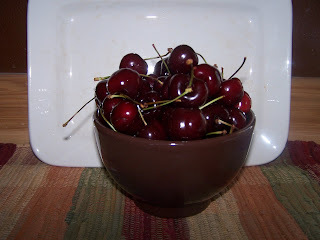 I bought some fresh local cherries at the Farmer's Market. MMM--they were so good and gone within hours. On another note, I would like to plug the new Robinson Crusoe show that will be out on NBC this fall. The lead actor, Philip Winchester is a former student and his family are friends of ours. He is a sweet boy, and a Christian who is trying to do the whole Hollywood thing God's way (which is not an easy task). You may have seen him in Fly Boys and he just finished touring for a year with the Royal Shakespeare Academy. Check out the trailer and watch it this fall! Sorry any younger single girls, he does have a girlfriend, another former student and friend of mine. We are crossing our fingers for an engagement soon! 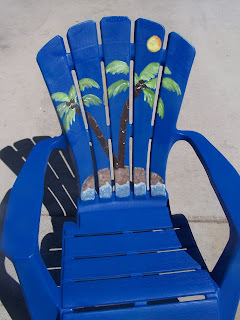 Off to paint a plastic Adirondack chair for someone. Cross your fingers that it turns out!